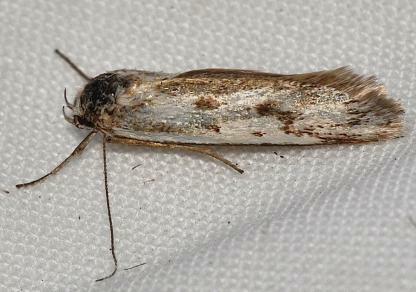 The adult moths of this species have off-white forewings with scattered brown markings. The hindwings are off-white. The head is white and the thorax brown. The wingspan is about 1.2 cms. CSIRO Publishing, 1997, pp. 331-334, 338. Series 1, Volume 10, Number 4 (1888), pp. 770-771, No. 406. Volume 1 (1915), p. 117.